A blockbuster monster movie where an out-of-control train plays the unstoppable beast. Made for fans of summer popcorn flicks. Rated PG-13 for sequences of action and peril, and some language. Despite being a suspense-filled action flick, Unstoppable is also a monster movie – the monster being a half-mile long, unmanned train with eight cars of very toxic highly combustible hazardous material traveling towards a heavily populated city at 70-something miles per hour. The train comes full with loud monster sounds. As several different teams try to devise plans to stop this beast before it causes an estimated $100 million is damages in the evacuated big city, two average engineers believe they have a better chance at stopping it than the others, so they take matters into their own hands and move their little engine towards the barreling behemoth. 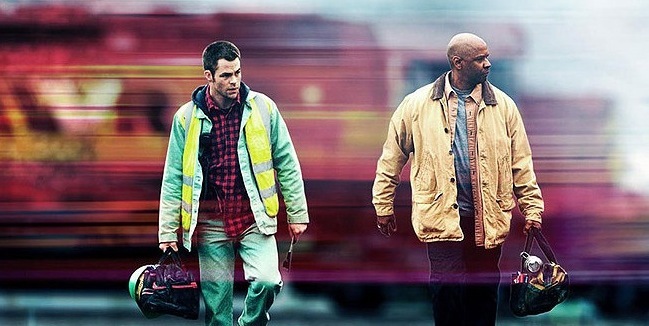 Denzel Washington (The Book of Eli) plays the experienced conductor that is taking the rookie (Chris Pine, Star Trek) out on his first run. As you would expect, Washington delivers. And surprisingly, Pine doesn’t play another Captain Kirk character, flexing his acting skills a little more than we knew he could. You usually have to wait until summertime to get big-budget intense action movies like Unstoppable. When made well like Unstoppable, I am a glutton for these movies. It is nice to have one arrive mid-November. Hopefully it will cause a trend that might give us a few of them each fall to help hold us over until summer. Unstoppable is intense, action-packed and unpredictable. It is the fun popcorn flick that each of us could use before the heavy holiday season. If you are at all a fan of summer blockbusters, then Unstoppable is right up your alley.